I’m frankly not excited about an Atiku Abubakar presidency. In a previous widely shared Facebook status update, which I developed into a full-length article titled “There Must be an Alternative to Buhari and Atiku” for my December 16, 2017 column, I dismissed Atiku as a cancerous old stager who is indistinguishable from Buhari. I also advocated a third force that is neither Atiku nor Buhari, which former president Olusegun Obasanjo quoted in his famous public letter to President Buhari. Nevertheless, if I have to choose between Atiku and Buhari, I’d choose Atiku with a lot of hesitation. There is no question that Buhari is the absolute worst president Nigeria has ever had the misfortune to be burdened with. He is thoroughly and irredeemably incompetent, not to mention unapologetically bigoted and lazy. Only a sick country would reward such a person with a second term. It is a measure of how much Buhari has lowered the bar of governance that Atiku is now not just an option but also an appealing one. Buhari is so contagiously incompetent that almost every Nigerian thinks he can be a better president than he is. That's why we have a higher number of presidential contenders for the 2019 election than we've ever had in our entire history. That's what you get when you have an insensate geezer as a president whose incompetence is on steroids! Atiku does have visibly thick, ugly ethical stains on him—at least on the perceptual, if not the evidentiary, level—which is why I'm not excited about him, but he is, without a doubt, cosmopolitan, passionate about learning, and infinitely better versed in the business of governance and managing a complex, multi-ethnic society like Nigeria than Buhari would ever be in a million lifetimes. Here’s why I think the emergence of Atiku as PDP's candidate has signaled the end of the road for Buhari. First, Atiku is a formidable and ruthless political steamroller who has fierce, broad tentacles in every part of Nigeria. He will crush Buhari’s naïve political machinery with merciless ferocity, particularly because Buhari is severely vulnerable as a consequence of his odious legacy of insouciance and do-nothingness. 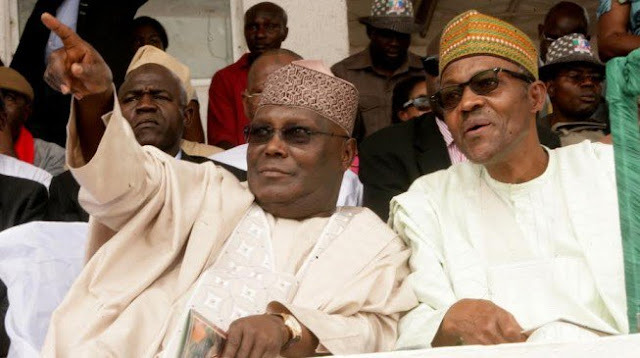 Nigeria’s current national mood and geo-political considerations also favor an Atiku win. Here is how. There are broadly five voting blocs in Nigeria: the Northern Muslim bloc (which isn’t based on contiguous geography), the northern Christian bloc (which is also not based on contiguous geography), the southwest bloc (which is impervious to religious differences), the southeast bloc (which is entirely Igbo) and the southern ethnic minority bloc (which is fairly co-extensive with Nigeria’s oil belt). A little note on the northern voting blocs. In the north, religion is the major, but by no means the only, instrument of mobilization and identity politics. That’s why, with some exceptions, Muslims in Kwara, Kogi and Niger states tend to have similar voting behaviors with Muslims in the northwest and in the northeast. The Christian north is also not geographically bounded and mocks Nigeria’s six geopolitical groupings. It isn’t limited to central Nigeria; it extends to southern Borno, southern Kebbi, southern Kaduna, most of Taraba, parts of Adamawa, Bauchi, and Gombe states. That's why Middle Belt scholars talk of the "geographical Middle Belt" and the "cultural Middle Belt," which are just roundabout ways of saying "northern ethnic minority Christians." For my analysis, I like to use "northern ethnic minority Christians" because it's more precise. To defeat Buhari, Atiku needs to win at least four of these blocs. Because of his history of comparatively genuine pan-Nigerianism, particularly in contradistinction to Buhari’s nakedly unremorseful ethno-regional chauvinism, Atiku will handily win the northern Christian, southeast, and southern ethnic minority blocs. Buhari may win the northern Muslim bloc, but certainly not by the same wide margin of victory he had always won it. Nigerian Shiites, the best-organized Muslim religious group, are mobilizing to vote against Buhari. He won their votes in 2015. There is also palpable mass disillusionment with Buhari in Sokoto, Zamfara and Kebbi states, and there is growing public opinion in the northeast that it’s time for someone from the region to be president. The late Sir Abubakar Tafawa Balewa was the first and last person from the region to be chief executive of the republic. So Buhari no longer has a lock on the northern Muslim vote. The southwest would be a battleground bloc, especially if Atiku’s running mate is chosen, as is rumored, from the southeast. Even though he has fiercely loyal, politically influential friends in the region, not to mention the fact that his first wife is from there, I don’t expect his victory there to be a cake walk. But the potential of winning three blocs and making significant dents on two others show that the auguries favor Atiku. Nevertheless, he shouldn’t bask in a smug glow of self-satisfaction and relax. Here is what he needs to do if he must unseat Buhari. The South expects power to return to it in 2023. The Buhari campaign says only a Buhari second term can guarantee that. Atiku can neutralize that by signing a legally binding, publicly available affidavit that emphatically states that he will not, under any circumstance, seek a second term in 2023. It’s not enough to just say it since Buhari, who makes pious but airy pretenses to “integrity,” has violated this pledge. His advanced age, in addition to signing an affidavit that can be used against him in court should he violate his pledge, will redound to his acceptability in the South. He should also actively reach out to people in the southwest, particularly those who are groaning under the weight of Bola Tinubu’s retrograde strangulation of the southwest polity, and strike a deal with them. Finally, it’s not enough to have a strategy for defeating Buhari; Atiku should also have a strategy for defeating INEC, the police, and the DSS—if you know what I mean. One way to do this is to get Western nations, particularly the UK, interested in the 2019 election and the danger that Buhari’s rigging would pose to Nigeria’s continued survival. A stern threat from the UK government to ban Buhari from visiting London if he rigs the 2019 election is enough to make him “behave.” Buhari is a servile Anglophile who will never jeopardize his chances to visit London, especially to see his doctors. A Buhari second term will end Nigeria as we know it. Of that, I am sure. Anyone, at this time, is better than Buhari. Atiku would have his own problems. Lincoln Steffens, an American muckraking journalist, once said, “Power is what men seek, and any group that gets it will abuse it. It is the same story.” So I cherish no illusions that Atiku won’t abuse power, but we are waiting for him. He would be an even easier president to take down than Buhari. I wrote this column on October 10 when Atiku Abubakar hadn't picked Peter Obi as his running mate.